Happy Friday friends! We’re looking forward to the weekend, how about you? 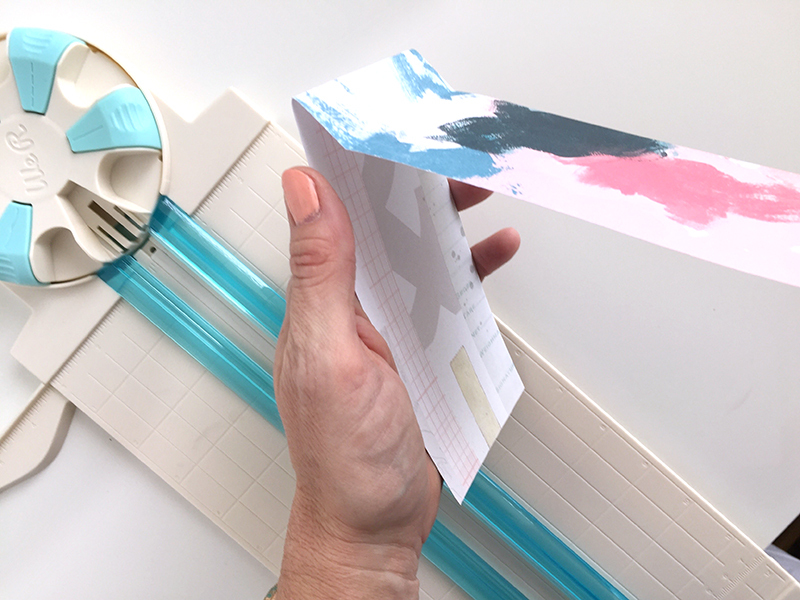 We’re also looking forward to some time to craft this weekend, and if you’ve got some crafty plans we’ve got some project inspiration for you featuring the new Spin It tumbler turner and accessories available exclusively at Michaels Stores. Head to one of the stores on this list and grab a Spin It for $49 (or less if you bring your coupon) so you can make some custom cups or tumblers for moms, dads, grads or bridesmaids. They make great gifts! Check out some inspiration and short time-lapsed videos below. Along with the Spin It tumbler turner, the collection includes several different colors and sizes of glitter, an epoxy kit, a prep kit, a glitter clean up kit, vinyl decals, mica powder and waterslide paper for printing custom designs. For more videos, visit our YouTube channel HERE. Thanks for stopping by! 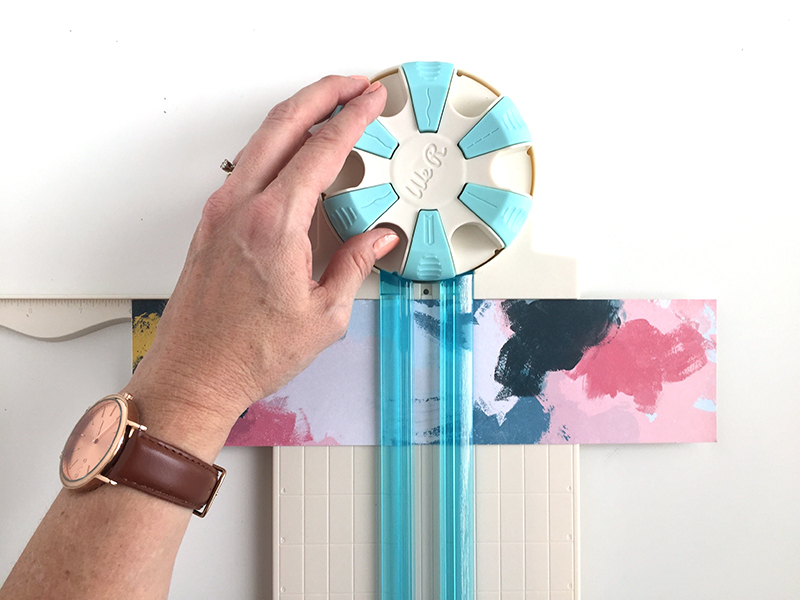 We hope you get the chance to create with this one-of-a-kind tool and craft. Have a great weekend! Hello We R Memory Keepers fans! Soraya here today to share my first experience making a tumbler with the new Spin It turner and its accessories! 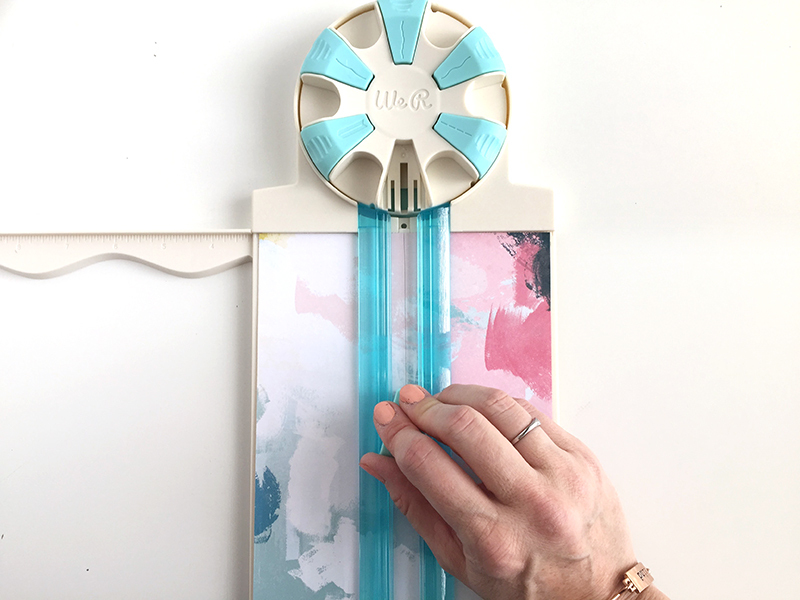 To make a tumbler you’ll need: the Spin It turner, spray glue, glitter, epoxy kit, gloves, popsicle sticks, wax paper to protect your surface and a cute vinyl design. The Spin It tool plugs into a USB power source making it easier to use! For this first experience, I used a spray glue but you can also use Modge Podge with a brush. Make sure to tape off the bottom and top of the cup before spraying the glue. I wanted a fun blue ombré so I went for silver, soft blue and navy for the color combo. I started on top of the cup with the lightest one : silver. Then I put back the glitter into the bottle thanks to the glitter clean up tray. I continued with the soft blue and finally the navy. Just let the Spin It turn at the lowest speed to be sure to put glitter everywhere! Smooth the color transitions with your fingers. When the glitter is set up and the glue is completely dry, prepare your epoxy resin with solution A and solution B. Don’t forget to wear gloves all along the epoxy process since it’s a chemical product. Also, be sure to read all the instructions before trying it! Keep your windows open unless you craft outside. A and B must have the same volume ratio before being mixed togerther. Gently pour the expoxy on the tumbler then use your hand (with gloves!) to spread the resin all over it. Once you’re done with it, remove the tape then let the tumbler on the Spin It turner for about 4 hours. And here is the beautiful result! Let’s add some fun with a vinyl design from the Spin It range. I chose to use the llama design. The vinyl is on a transfer paper that you directly apply on the tumbler then take it off like a rubon. Once the vinyl is perfectly in place, repeat the epoxy process and let the Spin It turn for about 4 hours. Take off the tape before letting the epoxy dry. The tumbler needs to dry 24 hours to be completely finished. And voilà! Here is my first tumbler! I hope you had fun joining me for this super cool experience. Happy creating everyone and until next time! Hello friends! It’s Aly here today with something I think might help get you through your Monday. 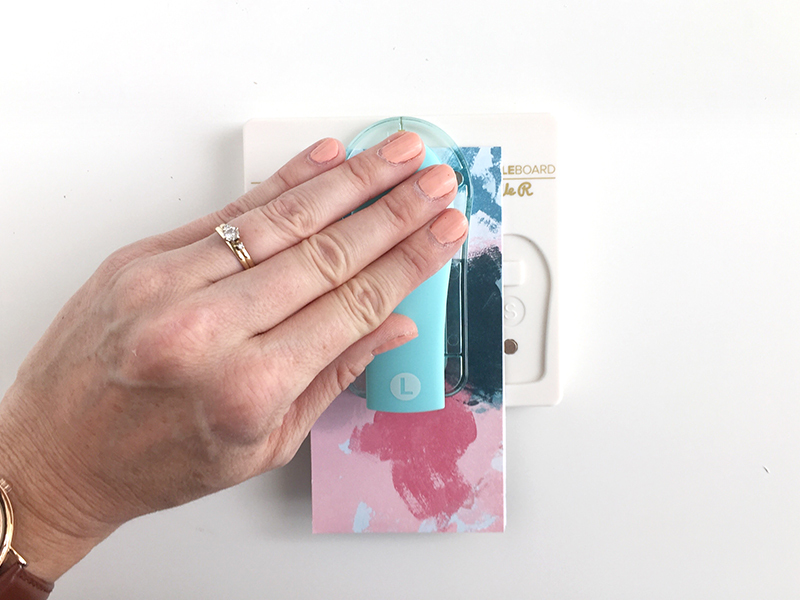 I’ve been dreaming of heading to the beach for a sunny and relaxing vacay, so when I got my hands on the new Spin It tumbler turner that’s exactly where my creative brain went! I made a custom beach themed tumbler that I can fill with ice and my favorite cold drink, and since it’s insulated it will stay cold for hours. I started out with a plain stainless steel tumbler that I picked up at Walmart, and looking at the colors of glitter on this tumbler now, I can just imagine lounging in the warm sand next to the gorgeous aqua water full of foamy waves under the clear blue sky. Are you with me? Full disclosure: I am not a tumbler making expert. This is a totally new craft for me, but I can’t be any more excited than I am to be starting this fun creative journey! These custom beauties make excellent gifts for grandmas, moms, dads, grandpas, grads, bridesmaids, teachers and more. I’ve got crafty plans to make a ton of these this spring to give away! There are so many ways to make glitter tumblers and tons of tutorials on YouTube so I did some research, watched several tutorials and planned out my project. I used Sticky Thumb Double Sided Red Craft Tape in two different widths to create the glitter stripes on my tumbler. That’s an easy way to get nice clean lines and to apply the glitter before coating the tumbler with epoxy. I also used a clear spray sealer to seal the glitter before adding epoxy. That way the different colors of glitter don’t get spread around and mixed up while adding the coat of epoxy. Work with epoxy in a ventilated area. We R Memory Keepers epoxy doesn’t have strong fumes, but it still has a slight smell that you may not want in your craft room or house. READ ALL INSTRUCTIONS FIRST! Epoxy has a limited working time so you want to be sure you know what you’re doing before you mix it up. If you want your glitter colors to really pop and look vibrant, try spray painting the outside of your tumbler white before adding the glitter (which I didn’t do, so my colors are more muted). Super Chunky glitter doesn’t work well with thin stripes–stick with large surface areas if you want to add super chunky glitter. Trust me–I know because I started with one color of super chunky glitter and had to remove and re-do some stripes. For medium glitter, apply one coat of epoxy and allow to cure completely. Then sand with medium grain sandpaper, buff with fine sand paper, wash thoroughly by hand, and then apply a second coat of epoxy. So, now that I’ve share some things I learned in my creative process, check out the video tutorial below. Please note: I did not take video of spraying the glitter sealer, or doing the sanding and final layer of epoxy since that part is pretty self explanatory and I already showed how to add the first layer of epoxy. I do mention them in the video so you know when those steps need to happen. So there you have it! I hope you’ve enjoyed learning how to make a Beach Themed Glitter Tumbler with the new Spin It collection. Thanks for stopping by, and keep dreaming of the beach until you get to the weekend–you can do it! Hello WRMK fans! I’m Rebecca and I’m happy to be here with you today! I do a lot of die cutting when I’m crafting. I also have a very small workspace so I don’t have room to keep a large cutting machine on my desk; I have to lug it out for each and every craft session. Admittedly, it makes me not even want to bother sometimes. That’s why I was so excited to start using the Mini Evolution from We R Memory Keepers. 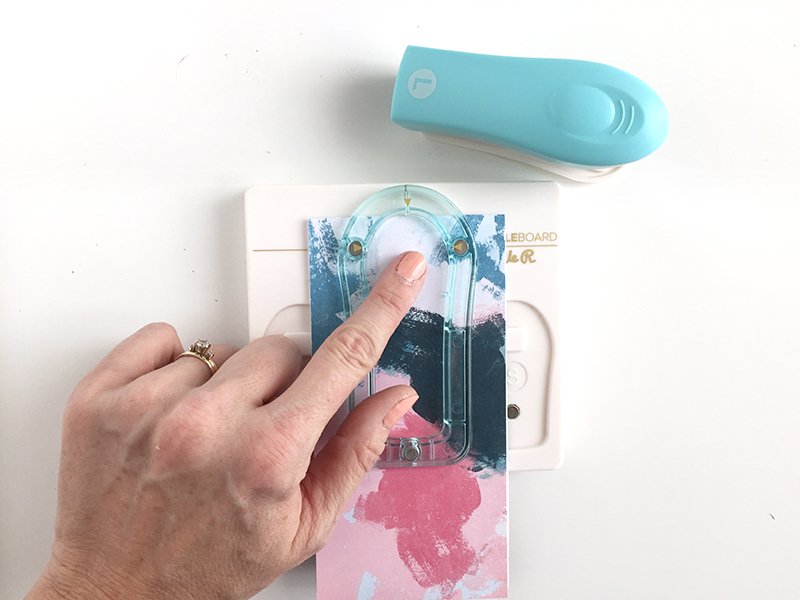 It’s small enough to keep out, and it comes with all kinds of fun things to whip up some cute and quick projects–read on! 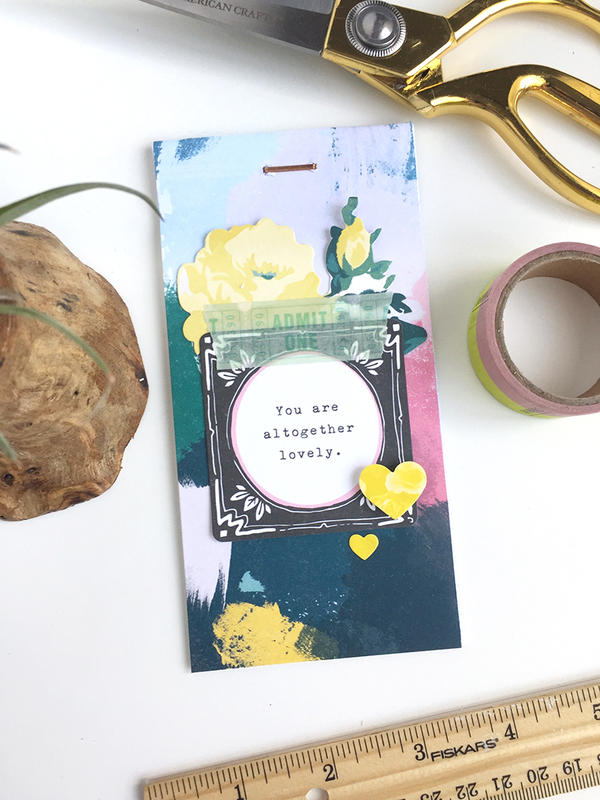 The Mini Evolution comes with 8 stitched circle dies nested together, as well as 2 embossing folders; one is polka dots and the other is a herringbone-type design. The plates are included to make the proper “sandwiches” for cutting or embossing, and there’s even a pack of 50 white and cream cardstock sheets that are already cut down to the perfect size for this machine! When I set out to decorate a birthday gift box duo for a friend, the ME was the tool I went to to create the tags. With papers by Heidi Swapp and Pebbles, I made 2 gift boxes with the 1-2-3 Punchboard. The floral print size is 4″ x 4″ and the navy-blue pattern is 3 1/4″ x 3 1/4.” After assembling the boxes, I die cut a bunch of circles from the white and cream stock, some patterned paper, and even some vellum. The machine and included tools cut and embossed all of them with ease. For the plain paper and vellum, I used the embossing folders to dress them up and add texture. I also used a sentiment die I already had to cut out “happy” and “birthday” after stamping them. The Mini cut them just perfectly, and due to the size of the dies I used, it was so convenient not having to use my bigger cutting machine on such small dies. It’s such a time-saver! After arranging all of my circles to my liking, I punched 1/8″ holes in them with my Crop-a-Dile, then strung them onto each box with white twine. *Tip: To get the ‘fanned’ look of the circles, I punched most of the holes off-center. If I wanted the tag to peek out from the right, I punched the hole on the left, and vice versa. I also made a couple of tassels for each package with thread and the Tassel Loom, which I strung on under the top-most tags. The final touch is a string of navy-blue sequin trim. You might be surprised by how much you can do with the Mini Evolution, and its size, for me, is the best thing about it. I’m excited to have a quick go-to machine I can leave out on my small workspace. It comes with a set of great dies and embossing folders, and also works with the wafer-thin dies I already own. 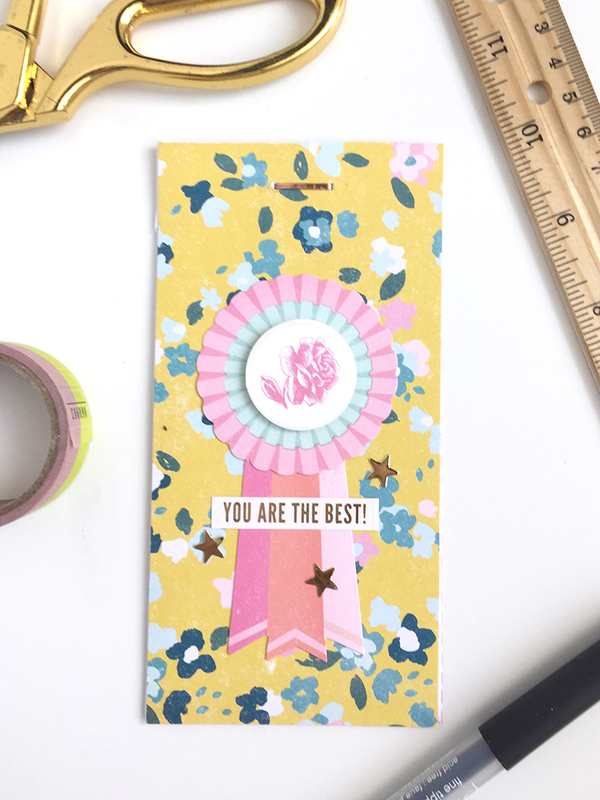 Die cutting projects just got a little less time consuming for me–and that is always a great thing! Hello We R fans! It’s Aly here to share a fun and easy DIY Traveler’s Notebook Cover with the amazing new Foil Quill pen and my Silhouette Cameo cutting machine. This summer our family is taking a long trip back east to visit some places where some of our ancestors lived to learn more about them. I’m so excited about this trip and I know it’s going to be so memorable, so I created this traveler’s notebook to record photos, stories and experiences along the way. I love that the cover closure includes a pen so I’ll always be ready to write down thoughts or details during our trip. Take a look inside of the cover. The notebook insert is one of the Amy Tangerine Journal Studio inserts, which helped make this project come together quickly and easily. Hello and Happy Friday friends! Today we’ve got some video tutorials to share with you featuring the award-winning new Foil Quill heat pen. We’re so glad you’re excited about this new release! The possibilities are endless with the Foil Quill and you don’t need to buy a new machine! You can use it with most major cutting machines on the market. For more information about Foil Quill please visit www.foilquill.com, including the FAQ page which has extensive tips, tricks, and trouble shooting suggestions. Then click below to watch four Foil Quill project ideas and tutorials using paper, photos, vinyl and leather. If you’ve got a Foil Quill we’d love to see your creations! Share them on Instagram and tag us (@wermemorykeepers) or share them on Facebook and tag us there too! Thanks for stopping by and have a great weekend! Happy Friday crafty friends! We made it to the weekend…phew. Today we’ve got a roundup of some cute and clever craft project ideas created with Happy Jig. We hope these ideas inspire you to get out your jig and create this weekend. Enjoy! One of our favorite Happy Jig projects to make is a cake topper! You can make a cake topper to say anything you want–the possibilities are endless. If you’d like to learn how to make the wedding cake topper below, CLICK HERE. Wire decor kind of lends itself to a wedding theme, so we’ve got another bit of wedding inspiration for you created with the Happy Jig. We love this pretty place card holder and table tent! You can find the full tutorial HERE. 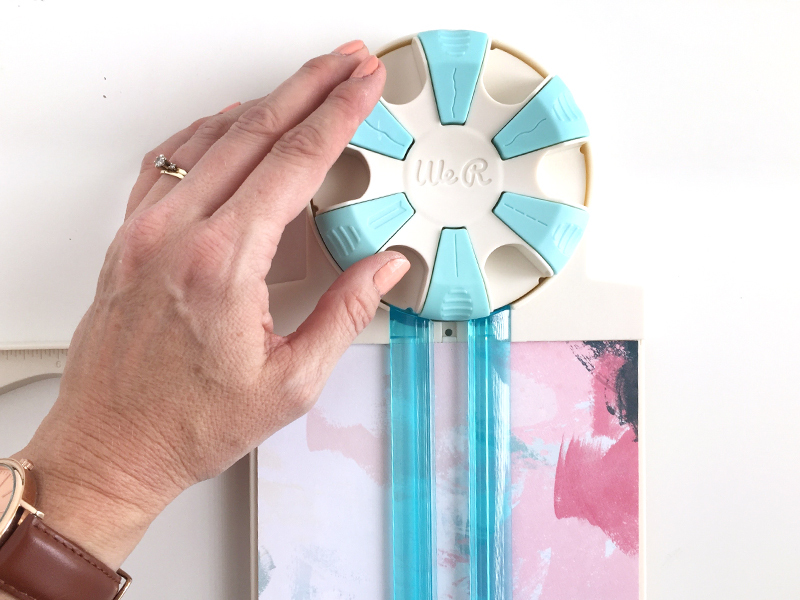 Custom wire embellishments add a sweet special touch to this fold out baby album. We think this is such a precious handmade gift idea! CLICK HERE for more photos and details. Send the guests home from your next party or event with favors decked in Happy Jig designs! We love this mermaid party favor idea! For the full tutorial CLICK HERE. 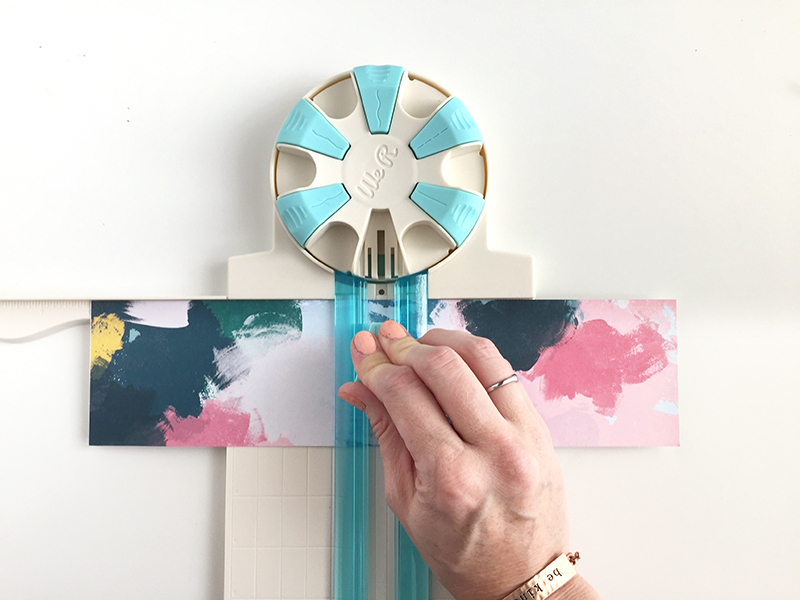 Make the title and story of your scrapbook page stand out with the Happy Jig! This travel layout is as unforgettable as the memories documented on it. Visit the blog HERE for more photos and details. We hope these projects have inspired you to get creative with the Happy Jig. Be sure to share your creations on our Facebook page HERE. We’d love to see what you’re making! Hello everyone! It’s Eva on the blog today showing you how to create a cute Pompom Keychain using the new Jumbo Pompom Maker and Tassel Loom. When I think about fall and winter my first thought is yarn. Yarn is perfect for sweaters but also to create home decor and accessories! 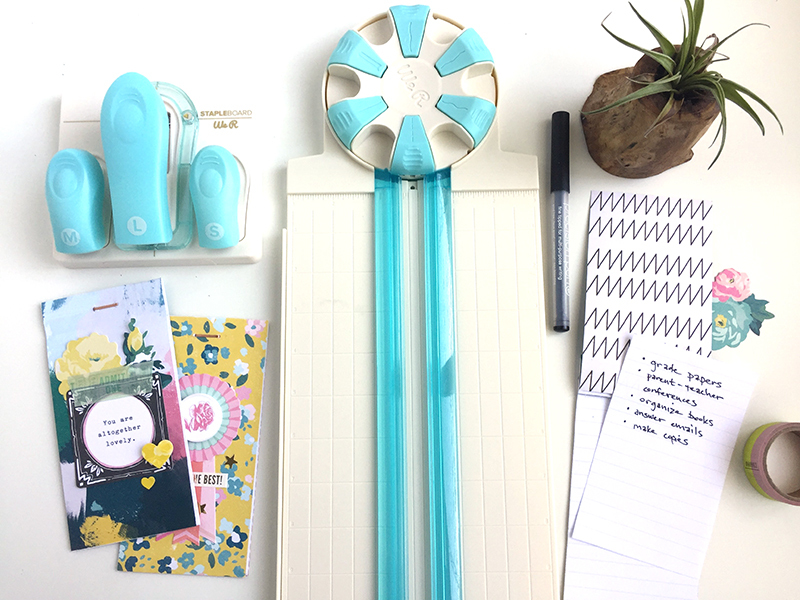 And now with the new Tassel Loom and the Jumbo Pompom Maker you can create beautiful pieces in minutes! To create this BIG Pompom Keychain start by making a Jumbo size pompom. I used a winter color palette and combined 4 different yarn colors. It is fun to mix textures too! Wrap your yarn around both arms of the pompom maker, you can mix them evenly or you can leave zones with only one color to create a fun and different pompom. Once you have wrapped your yarn close your Pompom Maker and cut the yarn between the arms. Tie a piece of yarn in the middle of the Pompom Maker and open it to reveal your pompom. To create a tassel simply loop your yarn on the 4 inch size. Tie a piece of yarn in the middle and close the Tassel Loom. Pick another yarn color and wrap it around your tassel, about 1 inch below the top of the looped yarn. Cut the yarn with your precission scissors following the grooves on the bottom and remove the rod on top to slide the tassel out. Decorate your tassel with colored beads and attach it to your pompom. Attach a hook to the top of your pompom and add your keys. This keychain is so BIG and fluffy! I love it and I think it is perfect to hang outside of your purse with or without your keys! Hello friends, it’s Aly here with a project I created for my daughter who’s off to college next week. Attending BYU is a lifelong dream for this girl! I’m so proud of her and I wanted to celebrate her exciting achievement with some fun dorm decor that she can proudly hang in her new digs. Her new school colors are navy blue and tan. Since the walls in her dorm room are a light beige (pretty close to tan), I decided to stick with navy and another coordinating blue color. I started by punching out her school letters with the Alphabet Punch Board. To give them a bit more emphasis I punched out two sets of letters from some dotted swiss Bazzill cardstock, one in the cornflower color and one in the navy color. Then I adhered them so that the darker blue creates the look of a shadow. I used my Crop-A-Dile to punch holes in the tops of the letters for hanging. Next, I made some pennants with my Banner Punch Board to give the garland that classic college feel. I made some tassels with the new Tassel Loom and some yarn I picked up at my local craft store in my daughter’s school colors. Last, I made some extra large pom poms with the Jumbo Pom Pom Maker and strung them together to make a garland with a tassel at each end. I hung both the pom pom garland and the school letters garland up with some fairy lights to complete the look. 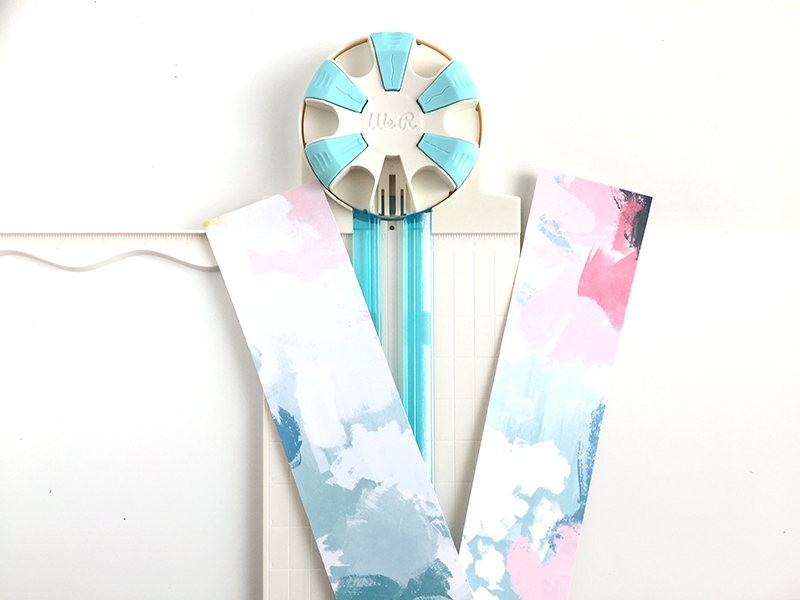 I love how easy it was to create this fun decor with my stash of We R tools, and I can’t wait to help my daughter get settled in her new dorm room next week. (Though I may shed a few tears driving home). Have a great weekend, and happy crafting friends! Hello there friends! 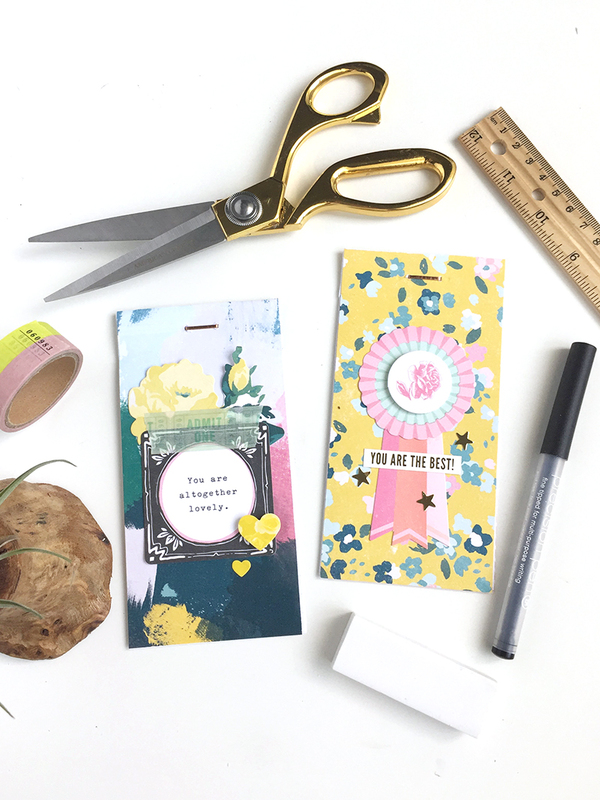 It’s Aly here today sharing a quick and easy gift idea for your child’s new teacher this year. Since my daughter spends so much time at school, and her teacher works so hard, I like to let her teacher know how much I appreciate everything she does at the start of the school year. 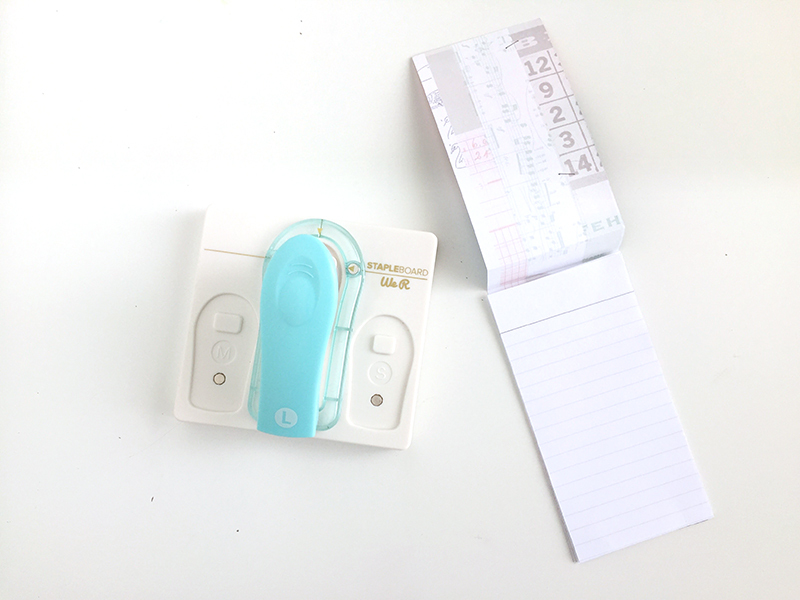 Check out how I made these DIY Perforated Notepads with my new Dial Trimmer. To create these teacher notepads, I had to cut several sheets of paper to size, score the covers, and perforate the pages inside. I was able to do all of this with just one tool. So easy! The Staple Board made it easy to bind the notepad pages together with the covers. I love the copper staples–so chunky and pretty! 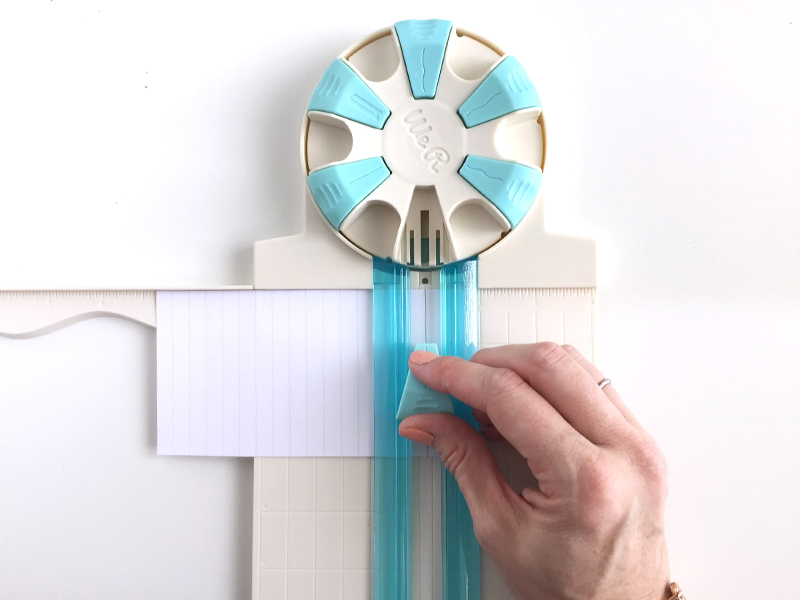 To make these back-to-school teacher gifts, I started by trimming the covers to 3×12 inch strips using my Dial Trimmer. That will make (3×6 inch notepads.) All I had to do was align my paper in the guide, turn the dial to the straight blade, then pull it down. Then I rotated the dial to the scoring blade, and scored the covers at 6 inches and 6 7/8 inches. Next I trimmed some lined paper to 3×5 7/8 inches (to make sure the bottom edges of the lined paper don’t peek out passed the edges of the cover). I perforated the top of each one at 7/8 inch–it was easy to turn the dial and do with the same tool! Yes! After perforating the lines pages, I assembled the notepads. I used the Staple Board to bind the covers and pages. I recommend using thin text weight paper inside. Depending on the thickness of your paper, you can staple between 7-10 pages inside your cardstock cover with the large staples. Test out how many you can do with scraps of the paper you will be using. Use the guides on the board to align your staple perfectly, and then press down on a hard stable surface using your bodyweight to help. 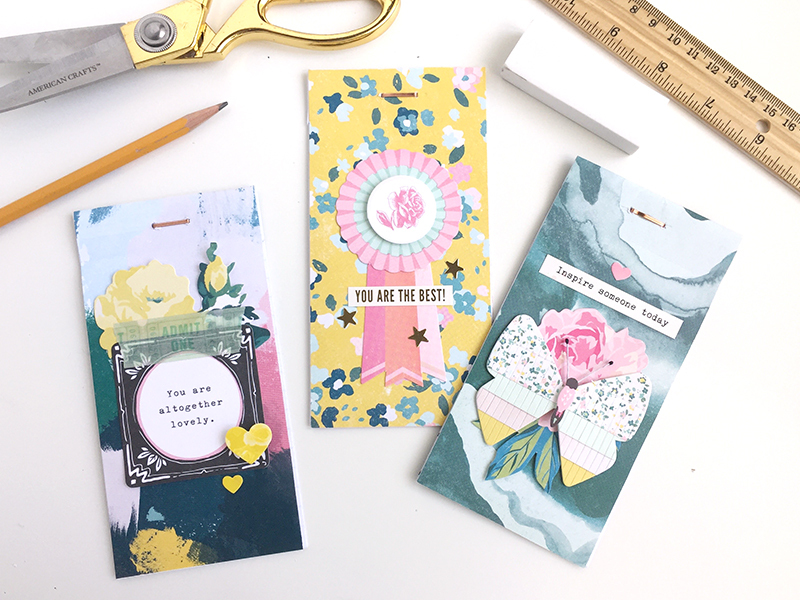 Once I stapled the notepads, I added a few embellishments from the Maggie Holmes Chasing Dreams collection to the front to match the covers from the same collection. I chose sentiments that I hope will inspire the teacher. I love that you can pull each page out if needed. 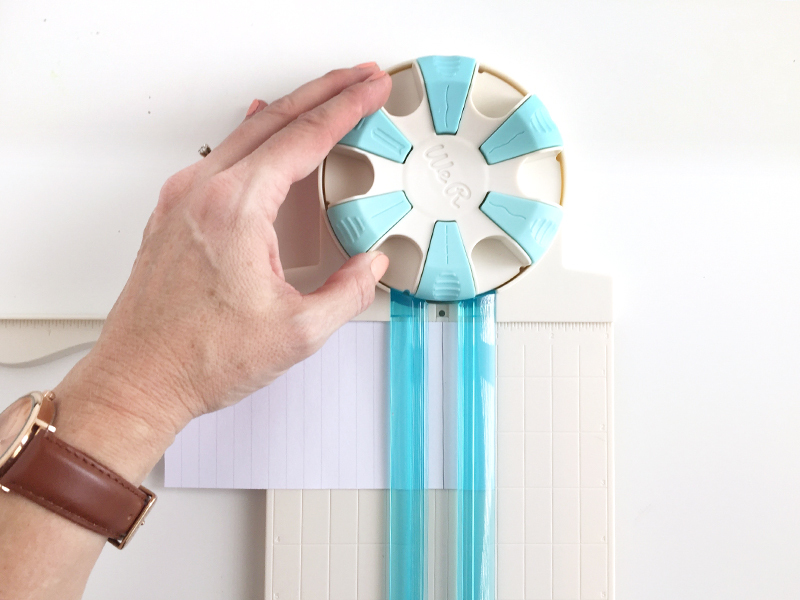 I love the perforating feature of the Dial Trimmer–so many possibilities! 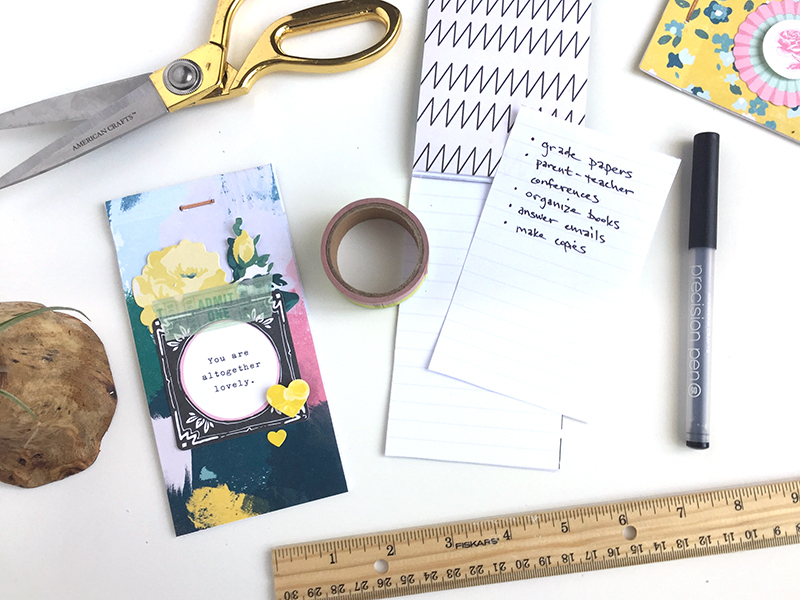 This project is a great teacher gift, but would also be perfect for your student, friends, neighbors, or coworkers. Everyone can always use another notebook. Especially when it’s handmade with love. This project took minutes with my new Dial Trimmer, and I hope my daughter’s second grade teacher enjoys them and will put them to good use. Thanks for joining me, and happy back-to-school crafting friends!